Today kicks off the Year Long Virtual Book Club for Kids, and my boys and I are thrilled to be a part of it! The featured author this month is Lois Ehlert. I joined the book club a little on the late side, so I chose a book from our home library that is already a family favorite. 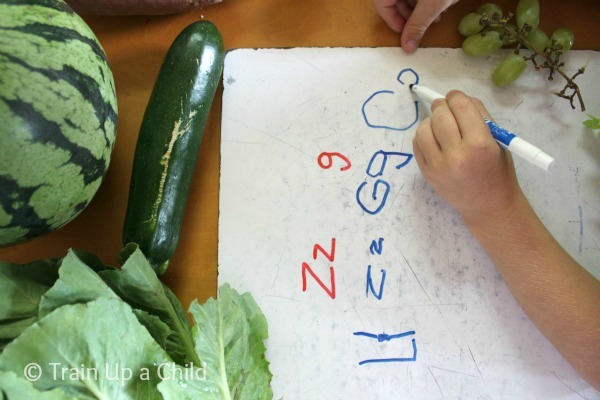 Eating the Alphabet: Fruits and Vegetables from A to Z is a beautiful picture book with large, colorful illustrations of yummy fruits and vegetables. After reading through the book a couple of times I led the boys to their table in the play nook where I had a few activities set up. I had filled up a pillowcase with a variety of fruits and veggies. The boys took turns reaching into the pillowcase selecting a piece of produce. I instructed them to keep their eyes closed. They felt each item, smelled it, shook it to see if any sound was produced, and then they guessed what they were holding. Most often they were right. JZ confused the zucchini for a cucumber and lettuce for spinach. J-Bug thought a black eyed pea was a green bean. All of their guesses were very close. 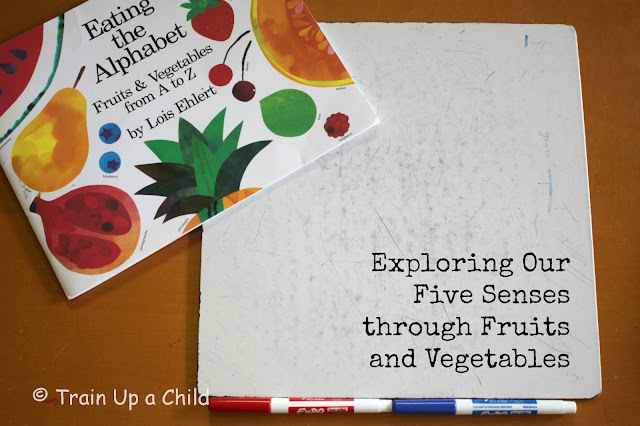 In addition to exploring the senses I had the boys do a few math and language arts activities. For each food JZ, age five, pulled out of the pillowcase he told me the beginning sound and wrote the capital and lowercase letters on a dry erase board . When he couldn't remember the proper way to write a particular letter I wrote it above in red as a guide. Three year old J-Bug found the beginning sounds in our wooden magnetic alphabet and put them on our DIY magnetic board. Next we sorted all the produce. We sorted by shape: round, long, and miscellaneous. We lined up all the food by size. Finally, we classified the produce by fruits and vegetables. 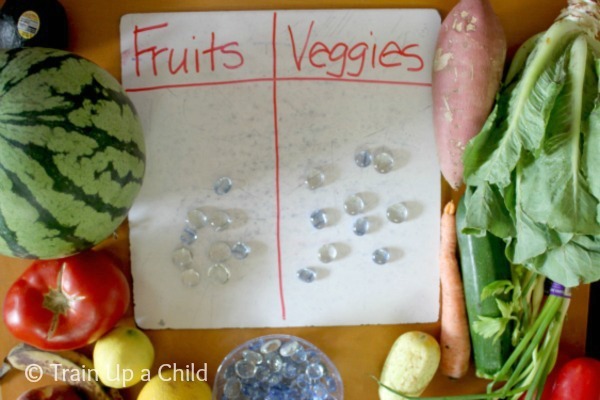 After sorting we made a simple graph using a dry erase board and glass gems . We had nine fruits and ten vegetables. JZ informed me that we had more vegetables than fruits and that one more fruit would make it even. Be sure and visit the participating blogs in the Virtual Book Club for Kids to see what everyone else is reading this month. I guarantee you will find a wealth of inspiration and ideas for all ages. 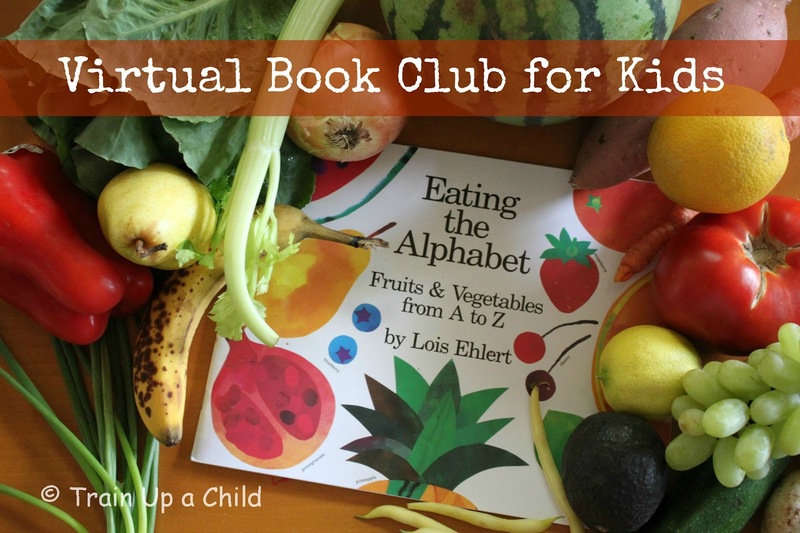 To join in the Virtual Book Club grab a button and link up! I'd also like to invite you to share a photo and/or link on Train Up a Child's Facebook page with your book club activity or craft. That alphabet game would be a huge hit with my kindergarten sidekick. He's obsessed lately with sounding things out. Love it! We're learning about senses right now. I have 2 boys probably about the same ages so now I have ideas for both!Thank you. Wonderful idea! Can't wait to do this with my little ones! I'm loving this virtual book club! We also chose Eating the Alphabet but my daughter is younger than your boys so we did a simpler activity. I'm so happy that we can revisit this book further down the road and use your post for inspiration! I love how in depth you get with all your activities with the book! 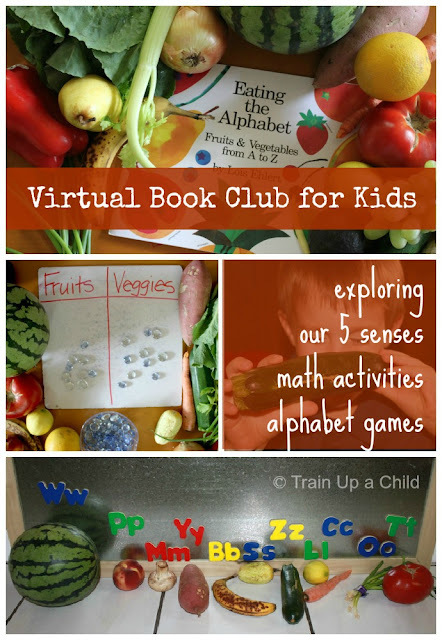 Allison, you do such a fantastic job creating fun and educational activities for your little ones! 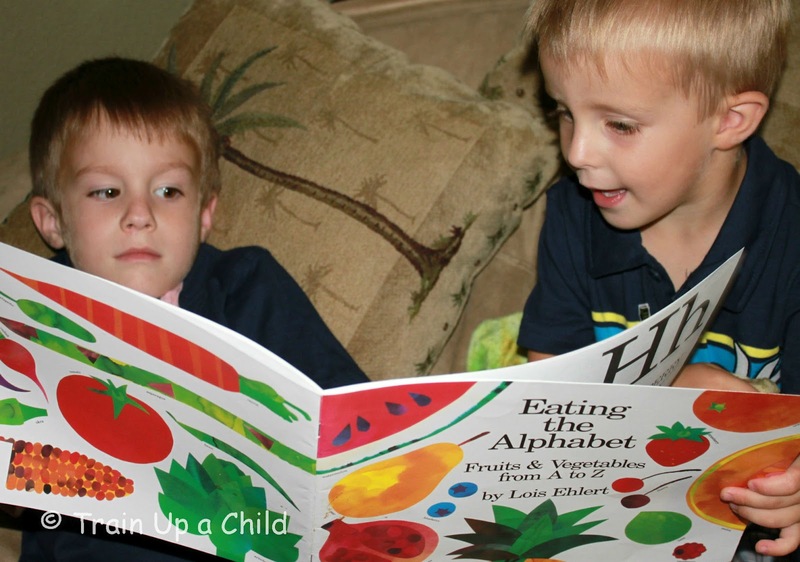 I bet they enjoyed "eating the alphabet." 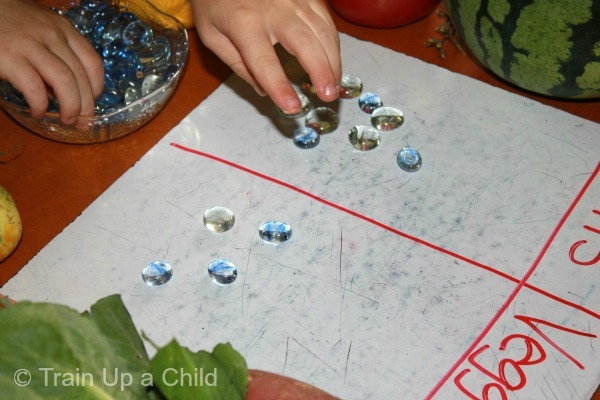 Making a T chart and using those gems was such a great idea, too! Wow, so many activities to broaden your little ones' interaction with the book. I love it! Love it!! I love how you sorted everything. I know that my DD would love to do that. love the idea of the marbles to count how many of each there were! thanks for linking up! 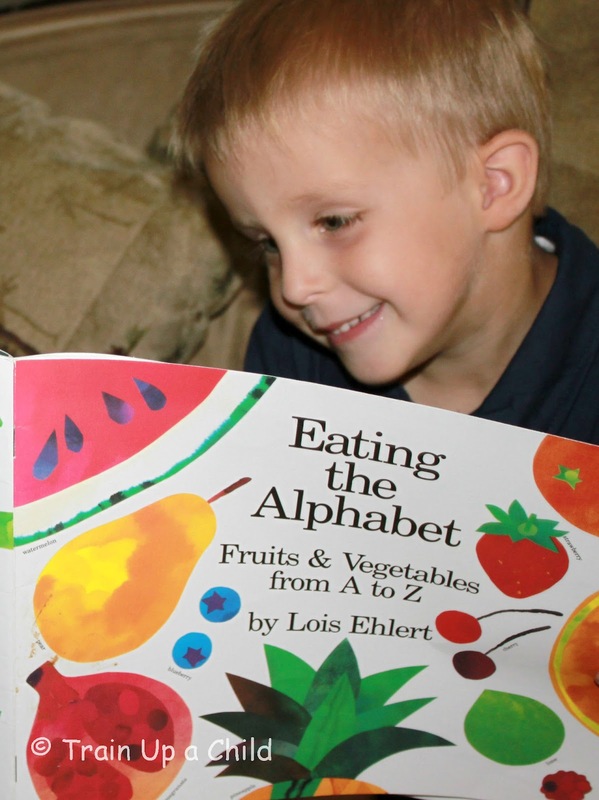 What a fantastic book and activity...especially to encourage healthy eating!! 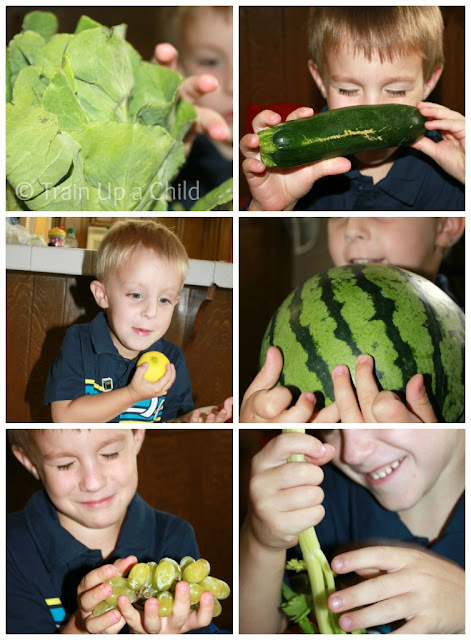 I love the variety of hands-on activities you incorporated to make it age appropriate for both boys! I love how you did so much with this book! We had it in the back of the car for the longest time and the kids never really enjoyed it -- we'll give it a "fresh" look with your great ideas -- thanks! What a great activity! You came up with so much learning from one great book! Thanks so much for linking up to this week's Discover & Explore!